, archbishop of Spalato in Dalmatia, was born about 1561, at Arba, and educated at Padua. He was remarkable for a fickleness in religious matters, which at length proved his ruin; otherwise he was a man of great abilities and learning. He was entered early amongst the Jesuits, but left that society to be bishop of Segni, and afterwards archbishop of Spalato but instead of growing more firmly attached to the church of Rome on account of his preferment, he became every day more and more disaffected to it. This induced him to write his famous books “De Republica Ecclesiastica,” which were afterwards printed in London; and in which he aimed a capital blow at the papal power. These books were read over and corrected, before publication, by our bishop Bedell, who was then at Venice in quality of chaplain to sir Henry Wotton, ambassador there from James I. 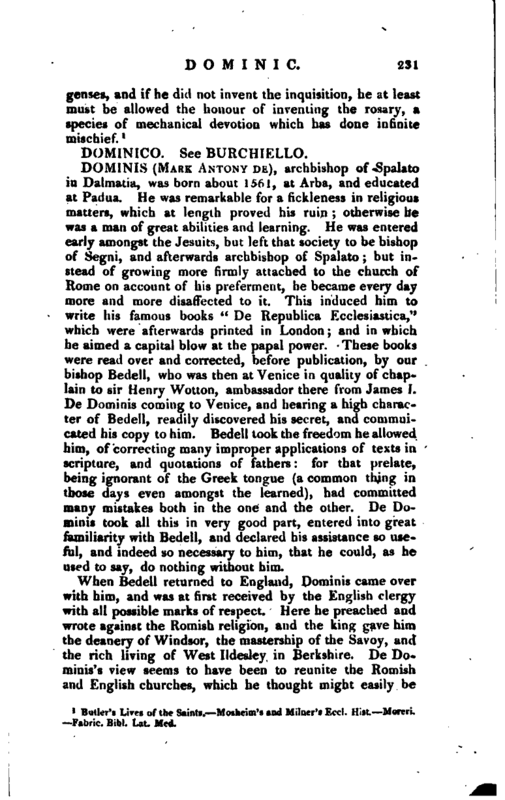 De Dominis coming to Venice, and hearing a high character of Bedell, readily discovered his secret, and commuicated his copy to him. Bedell took the freedom he allowed him, of correcting many improper applications of texts in scripture, and quotations of fathers: for that prelate, being ignorant of the Greek tongue (a common thing in those days even amongst the learned), had committed many mistakes both in the one and the other. De Dominis took all this in very good part, entered into great familiarity with Bedell, and declared his assistance so useful, and indeed so necessary to him, that he could, as he used to say, do nothing without him. When Bedell returned to England, Dominis came over with him, and was at first received by the English clergy with all possible marks of respect. Here he preached and wrote against the Romish religion, and the king gave him the deanery of Windsor, the mastership of the Savoy, and the rich living of West Ildesley in Berkshire. De Dominis’s view seems to have been to reunite the Romish and English churches, which he thought might easily be | effected, by reforming some abuses and superstitions in the former; “and then,” Grotius says, “he imagined, the religion of protestants and catholics would be the same.” After he had staid in England some years, he was made to believe, upon the promotion of pope Gregory XIV. who had been his school-fellow and an old acquaintance, that the pope intended to give him a cardinal’s hat, and to make use of him in all affairs; so that he fancied he should be the instrument of a great reformation in the church. This snare wa* laid for him chiefly by the artifice of Gondemar, the Spanish ambassador; and his own ambition and vanity (of both which he had a share) made him easily fall into it. Accordingly he returned to Rome in 1622, where he abjured his errors in a very solemn manner. He was at first, it is said, well received by the pope himself; but happening to say of cardinal Bellarmine, who had written against him, that he had not answered his arguments, he was complained of to the pope, as if he had been still of the same mind as when he published his books. He excused himself, and said, that though Bellarmine had not answered his arguments, yet he did not say they were unanswerable; and he offered to answer them himself, if they would allow him time for it. This imprudent way of talking, together with the discovery of a correspondence which he held with some protestants, furnished a sufficient plea for seizing him; and he was thrown into prison, where he died in 1625. 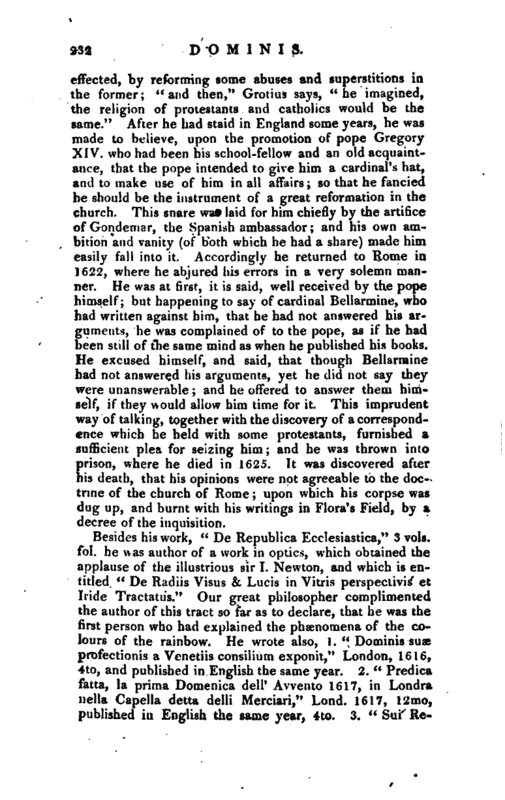 It was discovered after his death, that his opinions were not agreeable to the doctrine of the church of Rome; upon which his corpse was dug up, and burnt with his writings in Flora’s Field, by a decree of the inquisition. Moreri. Laruli Hi>-t. de la Literature rl’Italie, vol. 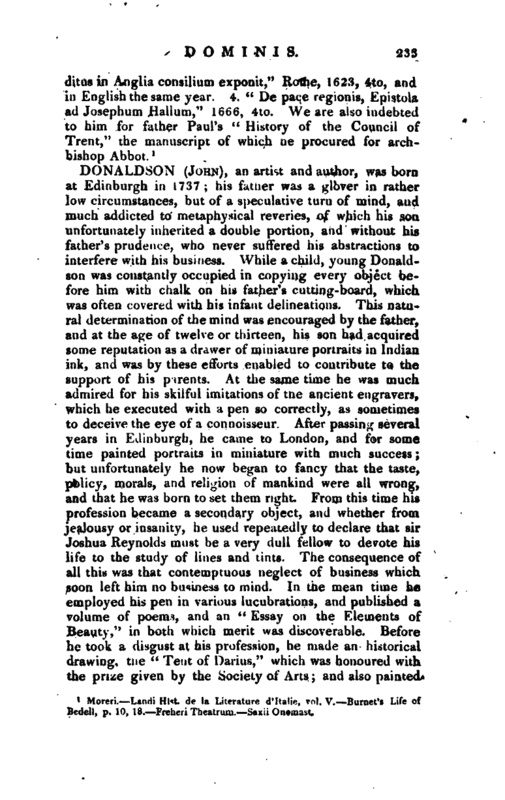 V. Burnet’s Life of Bedell, p. 10, 18. Freheri Theatrum. —Saxii Onomast.